Avengers: Infinity War has managed to score the single-biggest Thursday preview haul for a Marvel movie ever and the fourth-biggest opening Thursday of all time. And that’s not all: the movie has also managed to open to the second-biggest opening Thursday-Friday ever, with a weekend that rivals or exceeds Disney’s record all but assured. Deadline reports that Infinity War has opened to $39M according to Disney’s official estimates. This is just behind three other movies with similarly massive opening night hauls: Star Wars: The Force Awakens ($57M), Star Wars: The Last Jedi ($45M), and Harry Potter and the Deathly Hallows – Part 2 ($43.5M). For the weekend as a whole, current expectations put the movie’s gross above Deathly Hallows and The Last Jedi with at least a $225M haul expected, but others are more bullish and think that the film could open to the heights of $275M in the USA and Canada alone. As a whole, the movie is wildly successful across multiple platforms. The four New York and Los Angeles 4DX theater locations are completely sold out for the entire weekend thanks to interest in the film. Fandango reported that the film is the third-biggest movie ever in terms of ticket presales, behind only The Force Awakens and The Last Jedi. The film is also the biggest source of presales for tickets purchased through Atom Tickets. 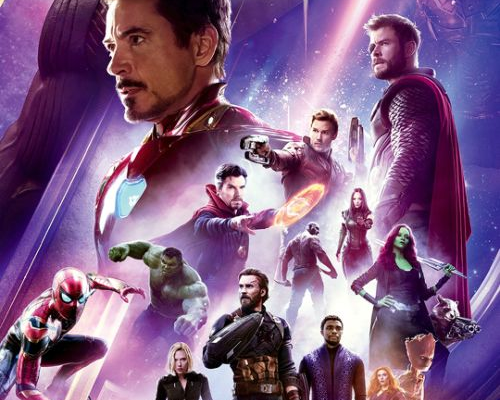 The movie has currently made $95M internationally (as it released a day or two ago depending on what part of the world you live in) according to Box Office Mojo, bringing Infinity War‘s current global haul to a mighty $134M. UPDATE, 4/28: The movie is now officially the third in history to have a Thursday-Friday opening gross of over $100M, with the other two being The Force Awakens and The Last Jedi. BoxOfficeMojo claims that the domestic opening is above $105M, while Deadline is arguing that it’s above $106M. Either way, that gives the movie the second-biggest single-day gross of all time – eking past The Last Jedi – and now puts the movie on an opening day total expected to go just past $245M, which is just slightly behind the near-$248M total given to The Force Awakens. There’s still room for the movie to climb, but that heavily depends on how many people check the movie out over today and Sunday. So far, word-of-mouth on the movie is looking strong. CinemaScore has revealed that the movie has scored an “A” from opening day audiences, while Deadline has added that the movie has a 83% “definite recommend” from Screen Engine/ComScore’s PostTrak method of polling (itself above the 75% buzz given to the critically-acclaimed Captain America: Civil War two years ago). PostTrak also notes that 93% of the responses to the film have been positive (compared to Avengers: Age of Ultron‘s 90% and Civil War‘s 88%), with the movie receiving a five-star rating from audiences. Oh, and of every ticket sold for Infinity War over the two-day period, over 36% of them were bought through Fandango. As for the movie’s full opening weekend, well, we have something else in mind for that: namely, a weekly series about the weekend box office. We’ll save that for tomorrow, along with the movie’s international numbers (which, like the domestic total, are outdoing expectations; the current total is at $178.5M).